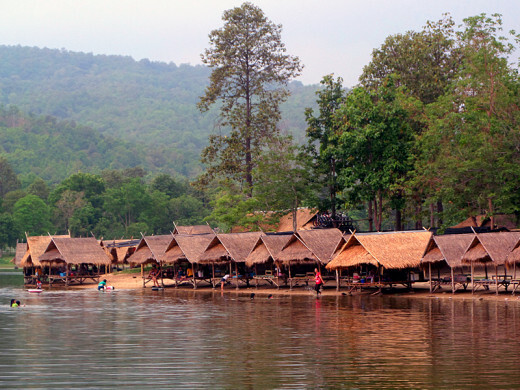 Located in Chiang Mai Province just a few miles north of Chiang Mai City in north Thailand, Huay Tung Tao Lake and Park is a popular place to visit and enjoy swimming, walking around or just relaxing in your own temporary little bamboo hut by the water's edge while ordering food and drink from the nearby staffed kitchen area. The huts, which are actually just a raised platform with low table and thatched roof, are free to use provided you order at least $10 worth of food and/ or drink. Alternatively, you can sit on the grass somewhere, (mat hire is available, too) but most people don't relish the idea of sitting under the tropical sun for any longer than they have to. Huay Tung Tao lies at the foot of the northern end of Doi Suthep-Pui National Park - a thickly forested mountain range, so the backdrop scenery is beautiful. There's a 20 baht charge to enter the park area. 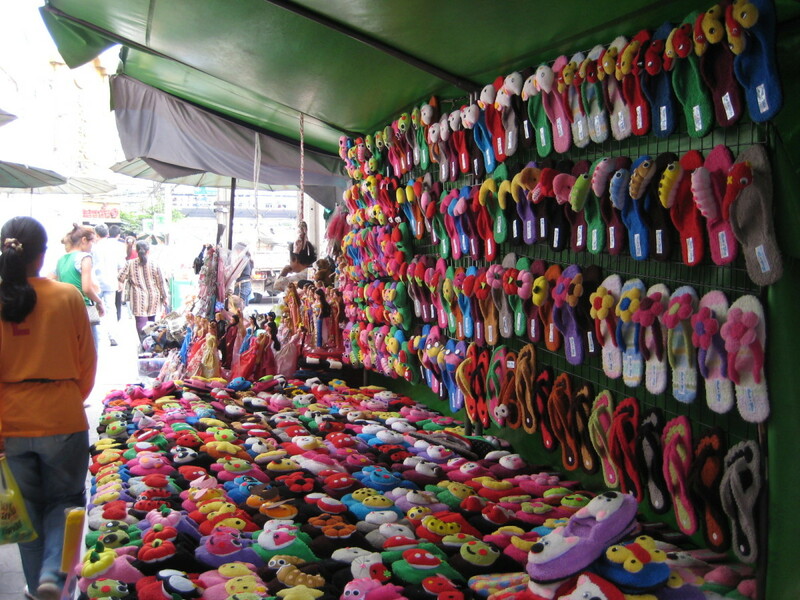 (US$1= 30 baht approx). The lake is actually a reservoir set in land owned by the Thai Army. Don't let that put you off, though. I've never seen any military personnel or hardware anywhere in the area. The water is warm and safe (being a reservoir) and has several sandy beach areas ideal for kids to play on. Although the lake is quite deep further out from the shore, the lake bed slopes gradually, so there are no dangerous hidden underwater fall-offs. Activities, apart from eating and drinking in your bamboo hut or on a mat on the grass, are swimming or bathing in the lake or boating. 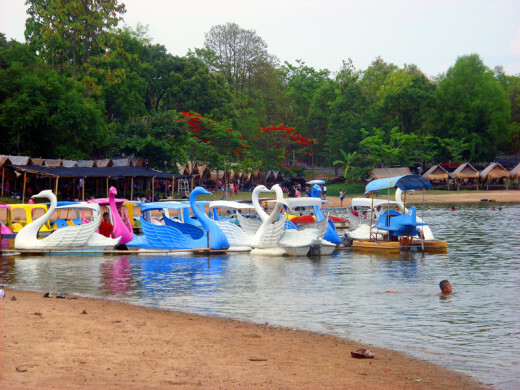 Swan-shaped pedal boats and catamarans can be hired and a life jacket is issued to anyone hiring one. Boats are only available on weekends and holidays when the park gets quite busy. On weekdays, you can almost have the whole park and lake to yourself. 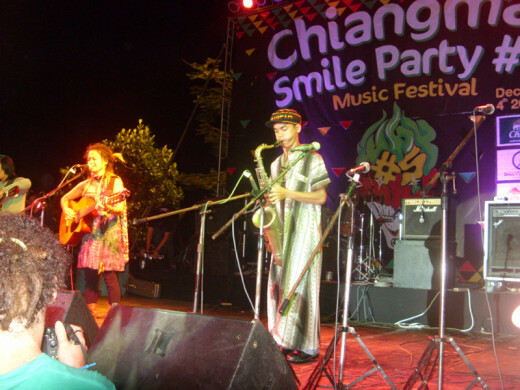 Every year around the beginning of December, several of the bars in Chiang Mai organise an open-air music festival by the lake called Smile Party, featuring local rock and reggae bands, fire shows, food stalls and lots of other entertainment. Tickets cost 300 baht (around $10), and transport from the bars to the park and back is free all night long until early next morning. Buy a ticket on the day or in advance from any of the bars involved, such as Babylon Bar or Roots Rock Reggae, which are both located at Boon Yoo Market in the lane off Ratchapakinai Rd. and Ratchawiti Rd. The most practical way to get to Huay Tung Tao Park, unless you want to hire a car or motorbike, is to flag down a red songthaew from anywhere in Chiang Mai. 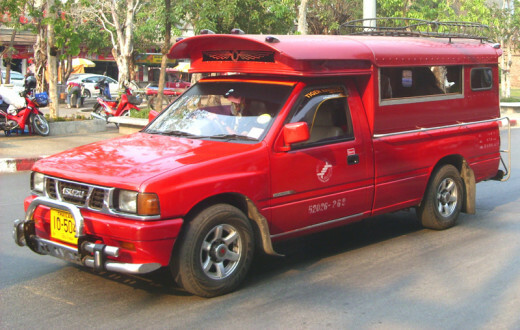 The driver will probably offer to take you there and wait for a couple of hours so that he can bring you back for around four or five hundred baht in total as that's more than he would earn by picking up local fares around town at 20 baht per person. Unless you intend staying in the park all day, it's worth agreeing to. As songthaews are shared taxis, he may also pick up anyone who flags him provided they're going in the same general direction. Only the red songthaews can be flagged. Others, such as yellow songthaews, operate scheduled routes to various outlying city areas with fixed fares. 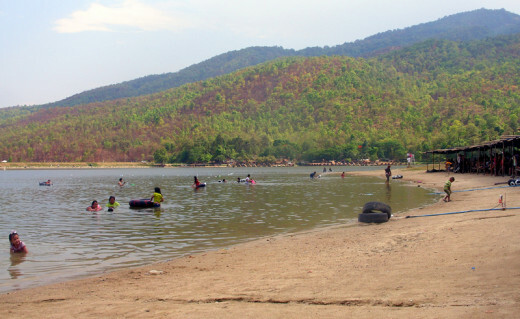 Huay Tung Tao is also on a popular hiking route, following a trail from Doi Suthep mountain down to the lake and park and beyond. If you're into hiking, (I'm not) you should search Google for information about the route if you want to do it solo, or about group hikes, which have the advantage of ensuring you wont get lost on the mountain somewhere. There are some well-organised hikes available - not paid tourist trekking with a Thai guide and a ride on an elephant -, but real hikes with expats and Thais who love hiking. Apparently there are some excellent views overlooking the lake and park area from the mountainside. If I find a good local Chiang Mai site that organises such treks, I'll post it here. Anytime Chasmac. It does look like fun. Thanks Kristen - Yes, those paddle boats are fun. Great post, Chasmac. I love those paddle boats over there. 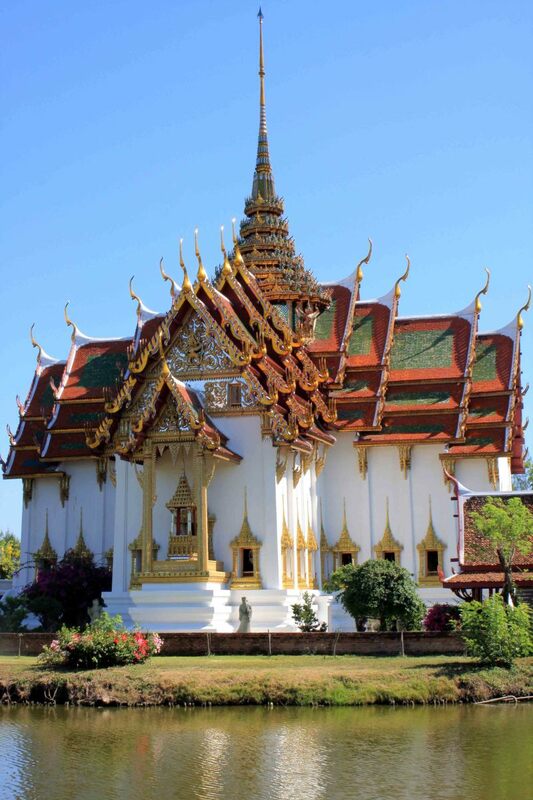 Thanks for sharing your travelogue hubs in your Thai adventures. Voted up! 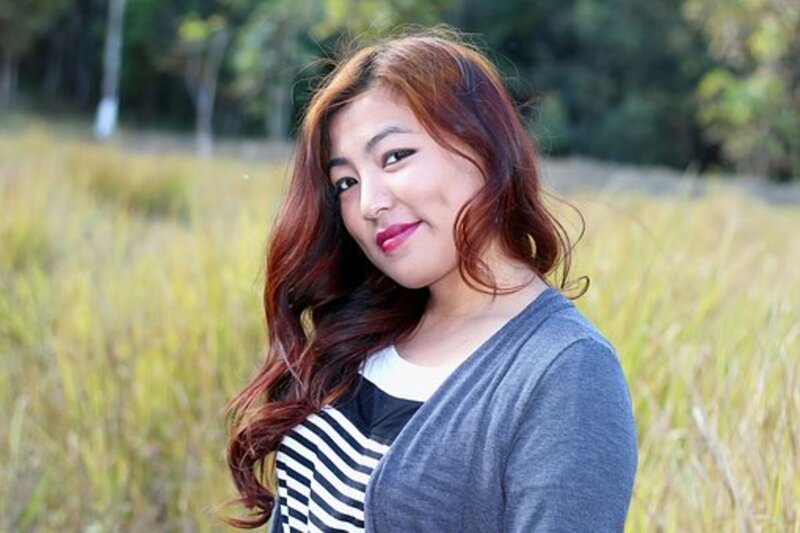 Thanks Akriti - I had a look at your hubs - Really useful and interesting for travellers. 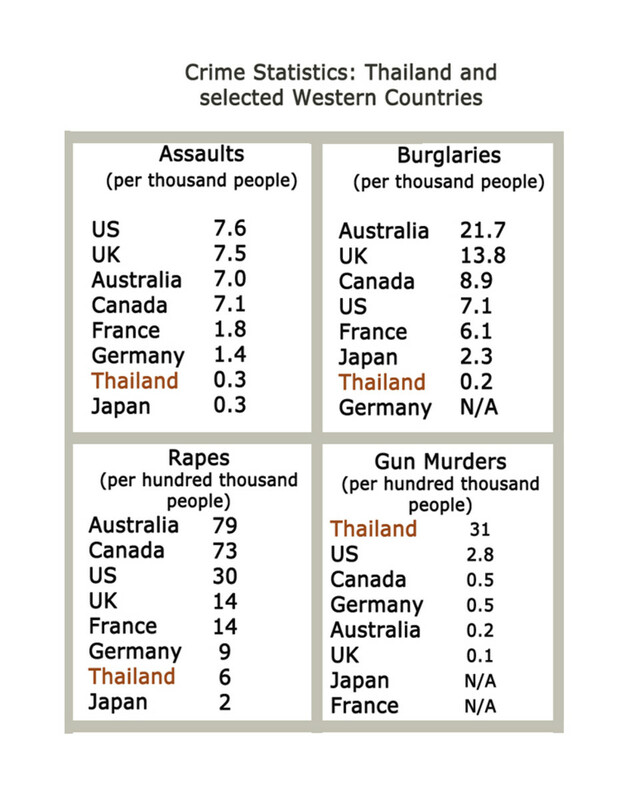 Yes, India is another fascinating country, although I've only been there one time. You're welcome Amine-sehibi and thanks for your comment. Wow chasmac, I never heard about this lake before, thank you so much for sharing this. keep it up.